Clackamas, OR (1/19/15) — Warn Industries is proud to announce their 2015 King of the Hammers Contingency Program for competitors in the Ultra4 King of the Hammers races February 4th – February 6th. A total of $2900 will be offered to drivers in Friday’s Nitto King of the Hammers race, Thursday’s Smittybilt Every Man Challenge race and Wednesday’s Polaris RZR UTV race. Additional details are listed below. 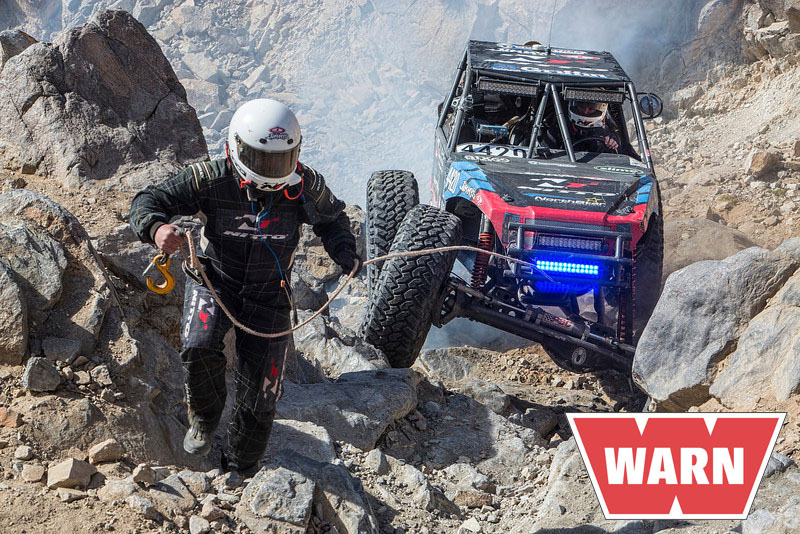 Warn Industries, the Official Winch of Ultra4, will have their consumer display and race support trailer located immediately to the right of the Main Meeting Tent entrance. Among the many WARN items on display will be the brand new ZEON Platinum winch. The ZEON Platinum will be powered and available for anyone to try the new and exciting wireless technology. WARN representatives will be available to answer questions while supporting racers and enthusiasts, and WARN products will be available through authorized dealers on the lakebed. Warn Industries is supporting many racers on the lakebed, including two-time King of the Hammers winner Shannon Campbell and TV personality Jessi Combs. Shannon Campbell will be racing in the #5AZ car qualifying during the Wednesday Night Power Hour for Fridays main Ultra4 Race. Last years Queen of the Hammers and Spec Class winner, Jessi Combs is on the pole position for Thursday’s Every Man Challenge Spec Class Race in the Falken Tire #4703 car. WARN winches is well represented in all classes including Pro 4400 4×4 drivers who will start the week qualifying for Friday’s main race starting position. Tuesday’s lineup of drivers includes Bill Baird of Bill Baird Motorsports, Bailey Campbell of Campbell Racing and Robert Daly of Big Red Motorsports. Wednesday’s WARN Team qualifiers include Shannon Campbell of Campbell Racing, Wayland Campbell of Campbell Racing, Brent Goegebuer from Team 4 Wheel Parts and Ryan Hagel of RCH Designs. Thursday’s Every Man Challenge Race will be lined with WARN Winches including Jessi Combs #4703 car, Mike Johnson #4588 from Ecko Motorsports who has finished three years in a row in the top 4 and Josh Niebuhr #4519 of Hazzard Fabworx Racing. Starting 2nd in the 4600 class will be a pink jeep with Gina Guccione #4687 of Team Radical Racing and starting 27th of 28 in the 4800 class is Jade Wickham #4823. Representing WARN in the UTV Class will be Dean Bulloch #1909 and 2012 UTV 850cc winner Chris Barnett #1961. 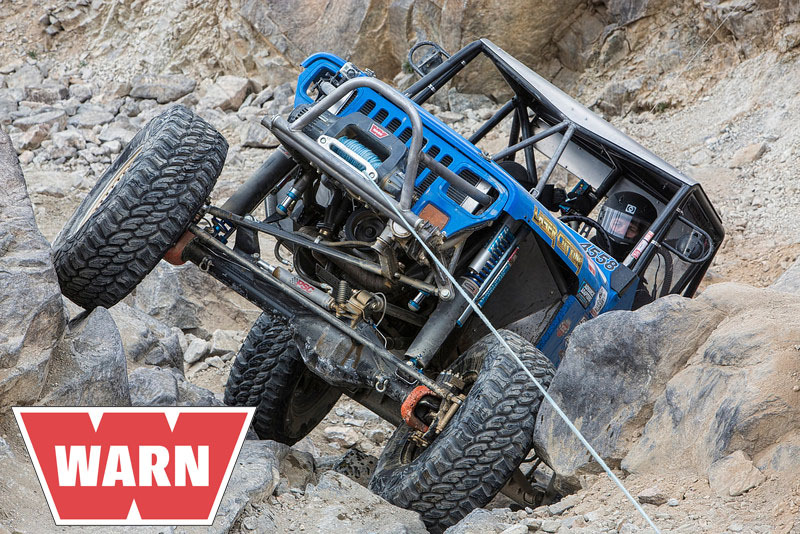 All racers running WARN Winches are welcome to drop by the trailer for assistance or stickers to participate in the 2015 Contingency Program. Have a WARN winch mounted on the raced vehicle when crossing the finish line. Have two WARN decals 3.5” x 6.5” or larger clearly visible on your vehicle during the race. Your vehicle may not contain any competing winch company decals. Payouts will be made to the winner of each of the following races in the amounts indicated. Winners will need to contact Warn Industries at: adamsa@warn.com with their name, address, phone number, and race category and placement (for KOH Main Event) prior to March 31, 2015 to receive payment. Placing will be confirmed and payments will be processed and sent to address provided via USPS. Please allow 4-6 weeks for processing.